Roger Thorne is an attorney who began freelance writing in 2003. He has written for publications ranging from "MotorHome" magazine to "Cruising World." Thorne specializes in writing for law firms, Web sites, and professionals. He has a Juris Doctor from the University of Kansas. Air travel rules can be a chore to deal with, particularly when you want to bring sports equipment along. While tennis rackets are not typically identified as lethal weapons, they can cause difficulties when traveling by air. Always check with your airline before bringing any sports equipment with you, so you can be sure what is or isn't allowed before you head for the airport. Anyone who has flown recently knows the detailed list of items you aren't allowed to bring with you on an airplane. 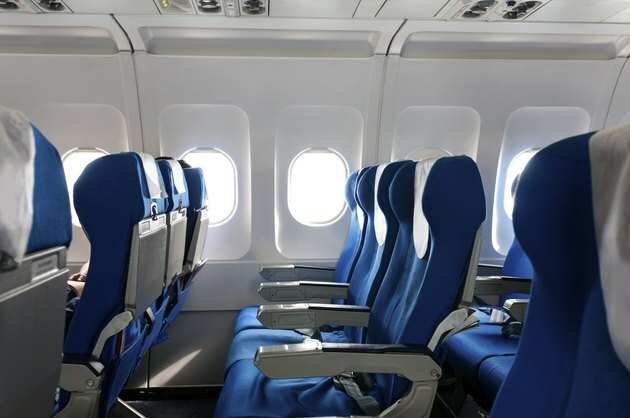 In addition to the plastic bag required for toiletries, and the ban on weapons large or small, the Transportation Safety Administration has a list of specific sports equipment that cannot be brought into the cabin of the plan. As of June 2010, the list of prohibited sports equipment does not include tennis rackets or tennis equipment. However, these rules can change at any time, so be sure to check before you fly. Further, just because tennis equipment is not included in the prohibited-items list does not mean you will always be able to take it on. Remember, you may always check your racket bag through at the counter if you are worried about taking it on board with you. In addition to the TSA requirements and restrictions, individual airlines have their own limits on what you can and cannot bring on-board. These mostly apply to the size and number of carry-on bags, but can differ from airline to airline. For example, American Airlines allows customers to bring one carry-on bag on board every domestic flight. The bag may be no larger than 45 total inches — as with a bag measuring 22 inches long, 14 inches wide, and 9 inches high. The combined weight of your bag and any personal items can't exceed 40 pounds. As long as your racket bag does not exceed these limits, you should be able to bring it on board. International travel can further complicate carry-on luggage allowances, bringing significantly more restrictive rules about what you can or cannot bring on board the plane. Again, these rules vary from airline to airline, and from country to country, so check with your airline before you travel. For example, Turkish Airlines allows business-class passengers to bring two carry-on bags, while economy-class passengers are only allowed one. The bags may not exceed the 45 inch limit (20 x 16 x 9), but the weight of each bag can't exceed 18 pounds. Can You Carry Medications in Your Purse on Southwest Airlines? How Should You Carry Breast Milk in a Diaper Bag? Can You Take Unmarked Vitamins on the Plane?